Two things are certain in Scotland in July: midges in the highlands, and tourists in the urban centers. Edinburgh suffers particularly from the latter. But at the far tag end of the Royal Mile, in a little alley, sits The Scottish Poetry Library, an oasis of leafy books amid the welter. It was there, on a little shelf all by itself, I came upon A Northern Habitat: Collected Poems 1960-2010 by Robin Fulton Macpherson. The name sounded oddly familiar, so I took a seat in that quiet place and read the back page to get acquainted with the work. Of course! This was the Scottish poet Robin Fulton who was also the renowned translator of Tomas Tranströmer, among other Scandinavian poets, long before the reclusive Swede won the big prize. Macpherson had used Robin Fulton as his authorial name for his entire career as poet, reviewer, and translator, and only when he retired from his teaching post, after thirty-odd years in Norway, did he return to using his family name. Since most literary critics will know him as Fulton, I will call him by that more familiar nom de plume throughout. 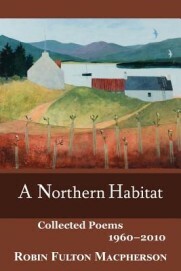 A Northern Habitat is a wonderful collection, and it deserves wide readership in the U.S. This compendium is chronological by the publication date of his books so it almost serves as a biography of his evolving work as a poet. Born on the Isle of Arran in 1937, Fulton’s early childhood was indelibly marked by the insular world of a Scottish isle bereft of most all the amenities of a burgeoning 20th century: electricity, motorways, household telephones, and much else. Only the German bombers, flying overhead on gloomy nights during the early 1940s to unleash their fury over Glasgow and surrounding factories, brought the modern world’s mighty technological changes to the door stoops of the crofters’ huts of Arran. how deep is the dark? Something in us has suddenly cleared. Behind us, our footsteps and voices. Behind the walls, a wide silence. The air is white and open, ready for snow. Each line forms a single sentence, an image unto itself. Stress and syllable create the tension as the poem here, like the sky, opens up slowly line by line. But upon examination, what exactly in us has suddenly cleared? And how does a still-life (of inert common objects) suddenly come alive? Behind us as well are our voices, yet how then are they also wide with silence? This is quintessential Fulton. His poems are compelling precisely because we can so easily become disoriented in them, like a child lost in a thicket. How to get out? Invariably the arresting way out is to be taken in hand by his disturbingly fresh images and led out of the briars into the open to look back and see the poems whole, like the sky. Wide-eyed, we read on. In a career spanning forty-five years, Fulton has been surprisingly tight-lipped about his work. Indeed, in one interview he seemed to greatly admire Philip Larkin’s response to how a self-effacing librarian from Hull came to write his poems: “Larkin’s brief and glum remark,” said Fulton, “was rather pleasant in the circumstances: he said something to the effect that most of his poems had been written in and around Hull with a variety of HB pencils and that there wasn’t really much more to be said.” There is something utterly refreshing about this sharp observation, as true of Fulton as Larkin, in our gadget-driven age when so many out-loud poets divulge every last fatuous thought via thumb-clicked media. Sparrows. Brown snow-flakes in a hurry. Sudden fruit bending a bare bush. Gone. motion debris from a distant blast. Geese who aimed themselves south are now runes. They breathe the sky of wonder emblems. on those who’ll stay. His handclasp is tight. of willow-herb . . .
was seen to be whole . . . Trees, notably, form an important and constant backdrop to Fulton’s poems, perhaps a faint legacy of filling in the absence of trees of so much of Scotland’s wilderness. Says Fulton: “If someone could scan my soul they might well see traces of a fear of chaos and of a panicky unease about large open unmarked spaces like the moors of Sutherland and Caithness.” The lyric, stanza-bound enclosures of his poems provide some of that sought-for comfort, as trees encompass their bounded fields of pasture. In one poem he asks “how many pages are in a tree” as if trees magically contained within their bark not only the pulp of the parchment upon which his poems are writ, but also the living image of the rootedness they impart to his poems. Some of his poems like “A Photo of Life and Art” and “Postcard” from his more recent work (1988-2010) play with inventive line breaks in more free-form styles, looking ragged on the page but suiting the staccato pile of images. But these are infrequent. While not averse to the longer poem, most poems in this fine book sit well on one page. For thirty plus years Fulton served as an instructor at what is now the University of Stavanger, in Norway, teaching many subjects in his native tongue, but oddly not English literature. One might call that an academic career, yet Fulton is entirely self-effacing about these years of teaching, always exacting in his modesty, putting one in mind of T.S. Eliot quietly adding up his sums in that London bank while The Waste Land rattled around. Similarly, there’s a delightful disparity between Fulton’s quiet modesty as an expat Scot and his magnificent body of work where his true craftsmanship of language shines through like a blaze. Some may remember him as editor for ten years of the seminal Scottish poetry journal Lines Review. Oddly, one of Fulton’s first major publishers back in the 1970s was a U.S. small press, New Rivers Press, that apparently had no fixed address, at one time out of Peter Howard’s Serendipity Bookshop in Berkeley (Tree-Lines, 1974), earlier still (the spaces between the stones, 1971) from a P.O. Box in New York City. But the Scottish Arts Council was farsighted enough back then to see the promise of this then-young Scots talent to fund the publications. One might suppose from this that Fulton would have garnered a broader American following. Sadly he is largely unknown. Counting chapbooks, his poetic output stands at under ten volumes, with many other seminal works of translation, as well as worthy works of criticism on Scottish poets. But it is certain that A Northern Habitat will stand the test of time. It is arguably, the most important book yet from a Scottish poet in this new millennium. This entry was posted in Uncategorized and tagged Winter 2014-2015 on January 27, 2015 by Kelly.